Sherry has drifted from place to place for most of her adult life in search of something. Though we're told initially that Sherry has spent her life wondering why her mother, Dumpling, slapped her one day, we know that there has to be a deeper reason for Sherry's restlessness. As she and Dumpling set off on a journey from Nevada to their family reunion in Georgia, you have to believe that she'll find answers along the way. More than just the story of one woman's wanderlust, Nowhere Is A Place is a family history, the story of how their family homestead came to be. Told through the words of Sherry, as she imagined it from research and conversations with Dumpling, it's a journey back to slavery and to present day Georgia. 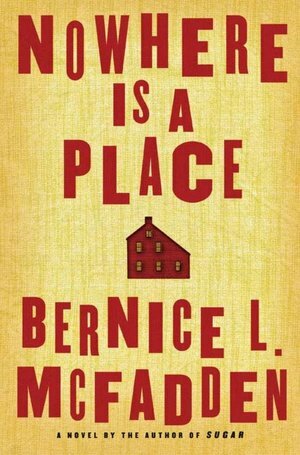 Beginning with the story of Lou, an Indian girl sold into slavery, right up to fast-tail Lilly, Dumpling's mother, who couldn't take another minute in that small town and sought the bright lights of Philadelphia, Bernice McFadden's words pull you in quickly. One aspect of the book that I really loved was that as Dumpling was reading Sherry's words, and observing her during their long drive from Nevada to Georgia, she began to gain a better understanding of who her daughter was. Often parents only know their children as the person they remember growing up in their house, not as an adult. Dumpling has no idea why Sherry is the way she is or why she does the things she does until she spends time with her and gets to know the adult Sherry. Prior to their road trip, she always thought of Sherry as her strange child or the child that didn't tell her anything about herself. I feel like by the end of their journey, Dumpling found her to be extraordinary and learned that while Sherry had been telling her about herself all along, Dumpling hadn't necessarily been listening. As I go back and listen to McFadden books that I've previously read, I'm reminded of works by J. California Cooper. This book, especially, made me think of Cooper's The Wake of the Wind. And though I enjoyed this book when I read it, the narration of Myra Lucretia Taylor really brought it to life.